Apple Banning Hackers From the App Store? 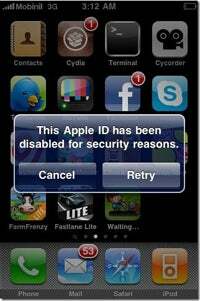 A curious thing happened recently to two prominent iPhone hackers: Upon trying to log in to the iPhone's App Store, they get error messages saying their Apple ID was banned for "security reasons." Sherif Hashim, who is finalizing a way to unlock the latest iPhone update for use on other cellular networks, reported the ban on Sunday via Twitter. Another hacker, iH8sn0w, who developed the Sn0wbreeze tool for jailbreaking iPhones with firmware 3.1.3, responded that he'd been banned as well. The blog Redmond Pie spotted the Tweets. It's not clear exactly what's going on here. Hashim hasn't yet released his latest work to the general public, but the nature of the project is public knowledge. Apple could be staging an offensive against hackers, but there's just not enough evidence to support that theory for sure. Even Hashim's not convinced; in later Tweets, he wrote that a new account he'd already created beforehand, using his wife's Visa credit card, was also banned. Hashim said the Visa rejection is "very weird, doesn't appear as an Apple act, but the timing is also weird." Still, the idea of Apple punishing iPhone hackers is plausible. The company has argued that jailbreaking should be illegal, saying the practice leads to piracy, clogs customer support lines when phones crash, creates security problems, and could potentially knock out cell phone towers. Nonetheless, some people jailbreak their phones to access forbidden iPhone apps. Given the isolated nature of these App Store bans, it doesn't seem like Apple's targeting average jailbreakers and unlockers, or even a broader swath of the hacking community. We'll have to see how things progress from here, but for now, consumers who don't care for Apple's iPhone restrictions, as long as they don't accidentally update to unsupported firmware.